Beat the eggs until light. Add sugar gradually. Blend in the cream. Mix together the flour, salt, and powder in another bowl and stir it into the creamed mix. Chill the whole mess an hour. Roll it out to 1/4 of an inch on a floured board, then cut it in 2-inch squares. (I did it with a pizza-cutter, it worked well.) With a knife, make two 2-inch indentations on each side of the squares. Bake 10-13 minutes at 375º F on a greased cookie sheet. 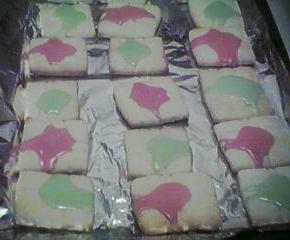 Let cool, and then frost with icing, preferably pastel-colored icing.